As famous fashion designer Coco Chanel once said, "Fashion has to do with ideas, the way we live, and what is happening." The quote perfectly explains the relationship that fashion has with popular culture and cultural trends, weaving in and out of the zeitgeist with reckless abandon, unencumbered by rules, and emerging on the street and at New York Fashion Week, Coachella, and many other places over the course of a year. As part of the POPSUGAR Future of Retail Experiences study, we wanted to explore the relationships between popular culture and apparel shopping and discover the influence that trends have on purchasing decisions. 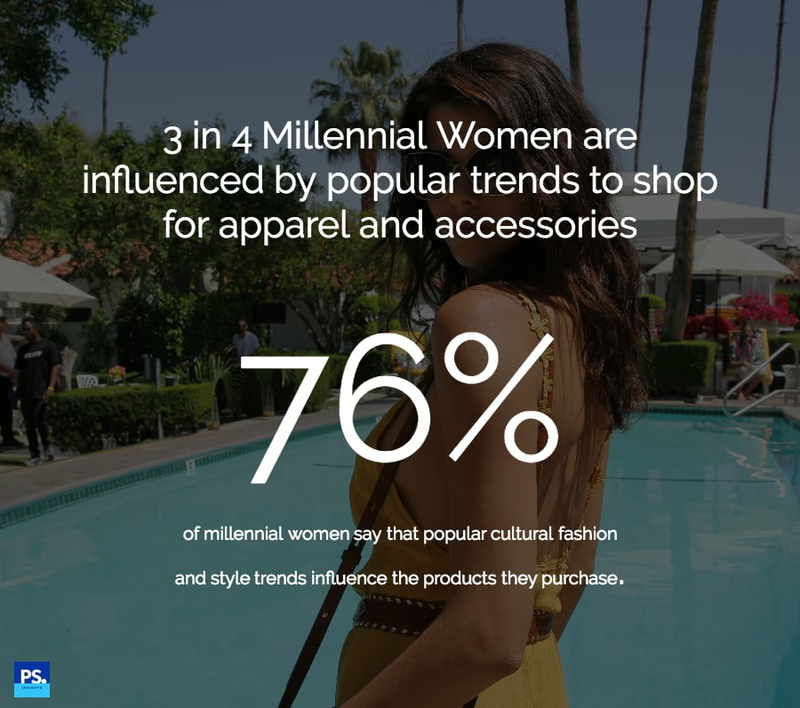 Over three in four millennial women say that they've been influenced by popular culture's fashion and style trends to purchase apparel and accessories. Millennial women are 10% more likely to be influenced by pop culture than women between the ages of 18-49, proving that the connection between pop culture and shopping spans multiple generations. Over the course of a year, there are many different types of pop culture events that can have a positive impact on shopping behaviors. Among millennial women, 34% say that individual seasonal fashion trends have impacted the apparel and accessories they've purchased. Thirty-one percent of millennial women said that evergreen trends like street style have impacted their purchasing behavior, and 23% say that specific fashion events like NYFW have impacted their apparel purchases. Fashion is bleeding into other areas of pop culture as well, as 22% of millennial women say that music festivals, such as Coachella, have impacted the apparel or accessories that they've purchased. Brands can take advantage of the connection between pop culture events and apparel shopping by creating unique pieces of content that showcase the trends that are sparking conversation at an event like Coachella or creating a gallery of the best looks from a specific event like NYFW. These pieces of content drive significant engagement and can inspire women to take action and purchase the products via shoppable content.